A new liturgy for Trinity Sunday this week, from Thom Shuman. And we list some books about the Iona Community for those who want to know more. We hope you find them interesting. Digital download: A lyrical, uplifting celebration for Trinity Sunday in which we discover that the Trinity is not so much a doctrine as it is a relationship – with us! A resource for individuals and groups wishing to explore the Iona Community’s integrated approach to spirituality in the space of four weeks. Each week covers an area of the Community’s engagement and the days include a ‘community experience’, a Bible reading, material for reflection, prayers and thoughts to ponder. The book was structured and edited by spiritual director and workshop leader Chris King, and written by members of the Iona Community, with contributions by Norman Shanks, Jan Sutch Pickard, Brian Woodcock, John Harvey, Peter Millar, Graeme Brown, Ruth Harvey and Neil Paynter. As the church becomes polarised in many places, many people are seeking a committed life which is radical, but also open, ecumenical and inclusive. Such resources as are found in the Community’s Rule give an anchor which works against the grain of suspicion, and states that there are alternatives, that a Christian life can be lived fully in ways which do not have, by definition, to be either right-wing or reactionary. 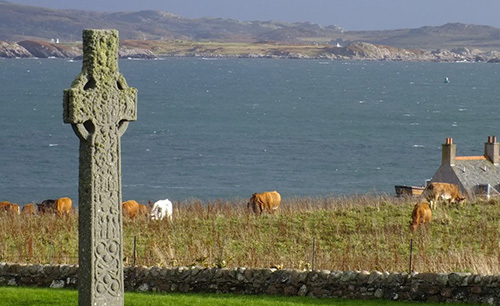 What is it that interests so many people in the work of the Iona Community and draws thousands of visitors each year to the tiny island of Iona? This is a book about the spirituality, concerns and activities of the Iona Community. Norman Shanks, a former Leader of the Community, shows how – in its work on Iona and elsewhere – the Community has developed an integrated vision which is rooted in everyday living. It is committed to peace-making and action on social issues; the breaking down of barriers between those of different faiths and styles of faith; and the development of new, relevant ways to worship. The country is bankrupt, the gap between rich and poor is widening, the church has retreated from the inner cities, and even in the more affluent suburbs many young people see the church as irrelevant – out of touch. No, it’s not the 21st century. It’s 1938. And a man called George MacLeod, and a group of like-minded friends and colleagues, have a vision of how to put the church with its message of good news to the poor right back at the centre of life. To make it speak again to ordinary people. If the rest of the church had followed their example, maybe the present day would have looked very different. This book is based on the stories of those people as told by themselves during a project to record the oral history of the early days of the Iona Community. A book of modern, engaged prayers following the rhythm of the Iona Community’s daily prayer cycle which is based on the many and varied concerns of the Community. Contributors include: Brian Woodcock, the Wild Goose Resource Group, Chris Polhill, Ruth Burgess, Peter Millar, Jan Sutch Pickard, Kathy Galloway, Joy Mead, Rosemary Power, Ian M Fraser, John Harvey, Ruth Harvey, Warren Bardsley, Norman Shanks, Alison Swinfen, Alastair McIntosh, Thom M Shuman and many other members, associates and friends of the Iona Community. The definitive study of one of the twentieth century's most fascinating and influential churchmen, an outspoken challenger to the status quo and the founder of the radical and often controversial Iona Community. The history of the Iona Community including St Columba’s founding of an influential Celtic Christian community on the Hebridean island of Iona in the sixth century; the work of George MacLeod whose inspiration placed Iona firmly on the Christian map once again in the twentieth century; and the broad span of the Community with its concerns for spirituality, politics, peace and justice. If you are a member of the Iona Community you automatically receive this newsletter as part of your membership. You will also receive this message by registering on our website, or if you have opted for email contact when making a purchase or sending an e-postcard. Wild Goose Publications is the publishing house of The Iona Community, a charity registered in Scotland. Charity number: SC003794, Company no. SC096243.